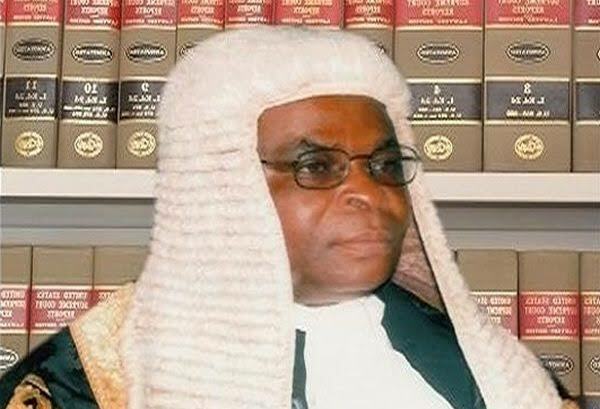 The embattled Former Chief Justice of Nigeria, Walter Onnonghen has said he resigned in the interest of the judiciary. This disclosure was made by his counsel Adegboyega Awomolo, SAN, a report according to The Nation suggests. The suspended Chief Justice of Nigeria, Onnoghen, resigned from office on Thursday. His resignation came less than 48 hours after the National Judicial Council (NJC) recommended his compulsory retirement. His resignation, it was learnt, was aimed at pre-empting the action that President Muhammadu Buhari would take on the report of the NJC. It was gathered that at the time the embattled CJN tendered his resignation, President Buhari was still seeking legal advice on whether to retire him or subject him to full trial on the allegations levelled against him. Onnoghen, however, decided to beat the President to it in order that he might remain on the honours roll of past Chief Justices of Nigeria and also enjoy the full benefits accruing to the office. Explaining why Onnoghen resigned his appointment, Adegboyega Awomolo, told our source that he acted in the interest of the judiciary. Awomolo is the lead defence lawyer in Onnoghen’s trial before the Code of Conduct Tribunal (CCT) on charges of non-declaration of asset. Another Senior Advocate in Onnoghen’s defence team, who sought anonymity, also confirmed that the suspended CJN put in his resignation letter on Thursday, saying that he addressed it to the President of the Federal Republic of Nigeria. Another top source in the Supreme Court said the suspended CJN resigned on Thursday evening following a fait accompli decision taken by the NJC. The source said: “The CJN was shocked at the decision of the NJC, so he offered to resign instead of being thrown out through compulsory retirement. “I think he chose resignation because it is a better option than a compulsory retirement, which implies some indictment. “The truth is that if a public or a judicial officer is compulsorily retired, he is not entitled to some benefits. “Technically, compulsory retirement has some stigma attached to it while resignation would allow the CJN to get full complement of his entitlements, including a N2.5 billion package. Another source, who confirmed the resignation of the CJN said: “I believe Onnoghen opted for resignation because President Buhari can either accept or reject his retirement. “And do not forget that if the President accepts Onnoghen’s compulsory retirement, he has to subject it to a two-thirds consent of the Senate in line with Section 292 of the 1999 Constitution. But a judicial officer who is conversant with the case said: “Onnoghen’s resignation is an afterthought, because he was given the same window when a delegation of the NBA met with Vice President Yemi Osinbajo on his fate. “It was decided at the meeting that some senior members of the bar should sell the resignation idea to him. Unfortunately, some lawyers persuaded him not to resign without knowing that the Economic and Financial Crimes Commission (EFCC) has more dossiers on him. “Going by precedent, NJC decision has more pre-eminence before President Buhari than an emergency resignation.